This walk: 2012-2-8. Pew Tor, Pu Tor, marker stone (1896), North Hessary Tor, King's Tor, Great Mis Tor, Great Staple Tor, inner marker (1847), bullseye stone. 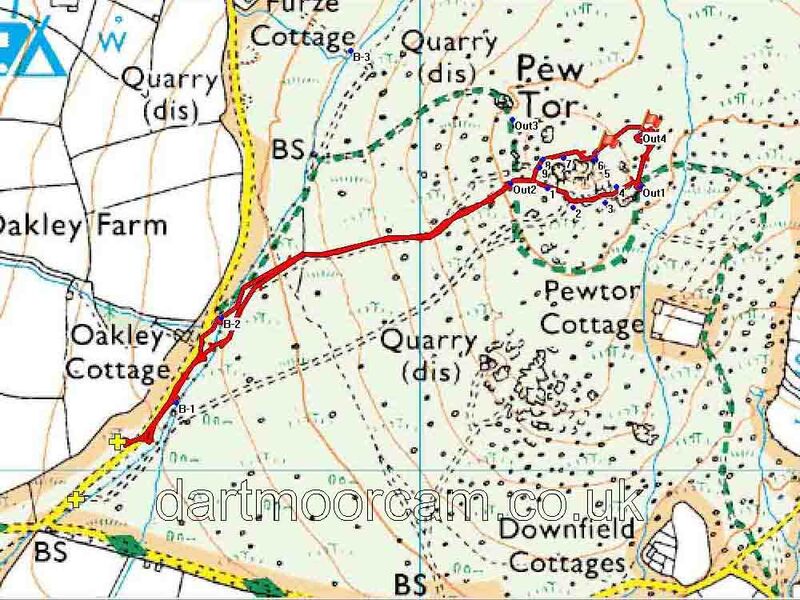 This walk was actually a short look at some 1896 stone workers' marks around Pew Tor (inside which stone was not to be taken) and then a search for a missing marker. There were four such marks cut into rocks, with another nine similar markers made earlier around the base of the tor in 1847. This is the recently found outer marker (from 1896) south-east of the tor, at SX 53347 73445. It is an inscribed 6-inch quartered circle with 1-inch holes drilled at the intersections. The south-west and north-west markers are well known although this south-east one was lost for a while and the north-east marker is still missing - the latter was today's quest. The north-west marker is actually a "double", being incised on the vertical and horizontal surfaces of a rock, very close together. The 1847 markers are 10-inch quartered circles without the drilled holes (see near bottom of this page). On this occasion, we walked from the marker above on a bearing of 25.5° (no magnetic allowance) for a distance of 400 links = 100 chains = 88 yards = 80.5 metres. These parameters were calculated from the old sketch map mentioned here: 28 Dec 2011. The resultant location was SX 53374 73526. Jan, taking a break in the sun. The ground was frozen solid. General scene of the Strollers searching for the missing marker; Pew Tor in the background, at SX 532734, elevation 320 metres (1049 feet). Have we found it? Have you, jiggery! North Hessary Tor, SX 578 742, elevation 517 metres (1696 feet), 4.5 km (2.8 miles) distant, behind King's Tor, SX 556 738, elevation 400 metres (1312 feet), 2.3 km (1.4 miles) distant. Great Mis Tor, SX 562 769, elevation 538 metres (1765 feet), also 4.5 km (2.8 miles) distant. Great Staple Tor, SX 542 760, elevation 455 metres (1462 feet, 2.7 km (1.7 miles) distant. Another view of Great Staple Tor, less zoomed, and where the sky appears more blue. Zoomed view up to Pew Tor. Berni and Annie huddling together for warmth - a rare commodity on this day! Another view showing the marker in relation to the tor. Bullseye stone in the Grimstone and Sortridge leat, beside the road, at SX 52690 73238, supplying water to Oakley Cottage, Oakley Farm and beyond (bullseye, side-branch water or "slice" going off to the left in the photograph). Sorry, Hugh - I didn't get that photo I thought I had taken - and it was a great picture! The walk is probably most easily approached via the road from the church in Whitchurch (the south-eastern area of Tavistock), following signs to Moortown but parking before getting there on the roadside below Pew Tor. There is roadside parking in the area of the yellow cross on the map, which is located at SX 52527 73058.